If my kids ever whine “I don’t want to eat that. I want ____, instead!” I always borrow a little phrase my mom would say: “Sorry, I’m not a short order cook!” 🙂 That phrase has so much more meaning to me now that I’m the one making the meals for my family. I cook a meal that works for that night, based off of what needs to be used from the fridge, and they get to decide how much they want to eat. I totally believe it’s part of why my kids eat whatever is in front of them. It’s just silly to cater to everyone if they’re all asking for something different to eat. However, I LOVE meals like this Taco Soup that are easily tailored to fit everybody’s appetite. My two year old loves avocado chopped on hers, and my four year old wants an extra scoop of “sour cream”. (I totally use Greek yogurt as “sour cream” in our house, and no one is the wiser.) My husband loves crushed tortilla chips and hot sauce in his, and I love extra chopped cilantro in mine. Everybody wins! Plus, the abundant topping ideas really take this soup from delicious —> to fantastic. This taco soup really is a dinner win! It’s EASY to throw together with simple ingredients, and everything is cooked all in ONE PAN. Hooray for one pan meals! I’m hoping you’re like me and you’ve already got most of these ingredients in your pantry, begging to be thrown together for a quick weeknight meal. And if not, ADAPT it. The first step to making taco soup is to brown the beef. Once it’s cooked through, add all of your ingredients (beans, diced green chilies, crushed tomatoes, corn, chicken broth, and spices. Bring this mixture to a boil reduce the heat to simmer and let it cook for about 20 minutes! It’s that simple. 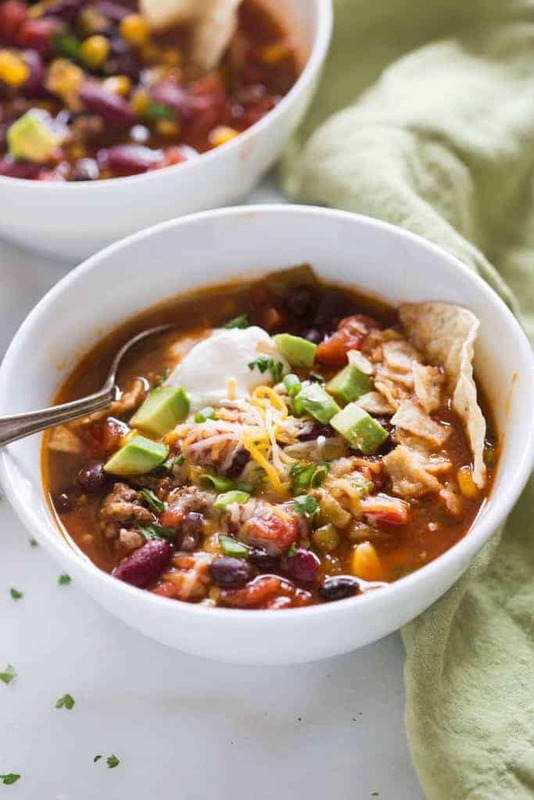 Serve taco soup with desired garnishes like avocado, cheese, tomatoes, sour cream, etc. 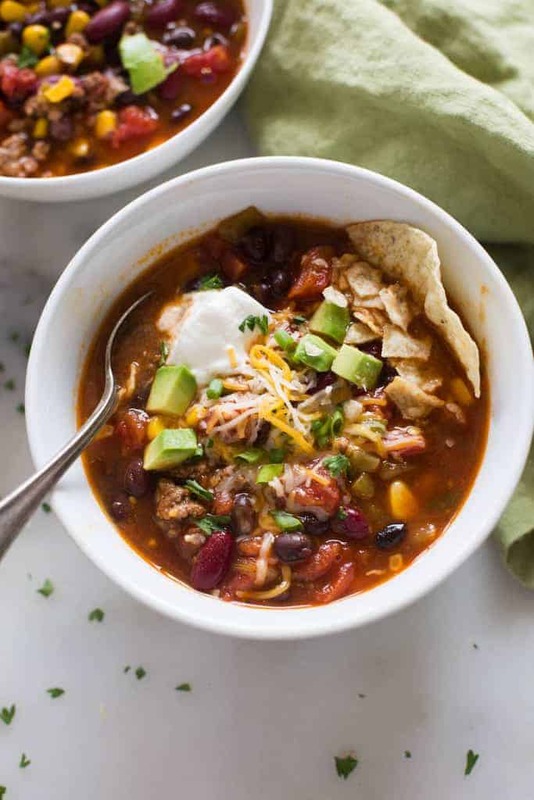 You can make this taco soup on the stovetop in less than 30 minutes, or even make it in your slow cooker/ crock pot and let it cook all day long while you’re away. To make taco soup in the slow cooker, follow the directions for this recipe listed below, but after browning your beef, add all of your ingredients to the slow cooker. Cook on low for 4 hours. The soup is bursting with flavor from all of the delicious spices, beans, and corn. Then layer it with your favorite toppings and you’ve got a warm, comforting dinner that everyone will love. Few things make me feel more like a rockstar than being able to freeze leftovers for an easy dinner that can be made another day. 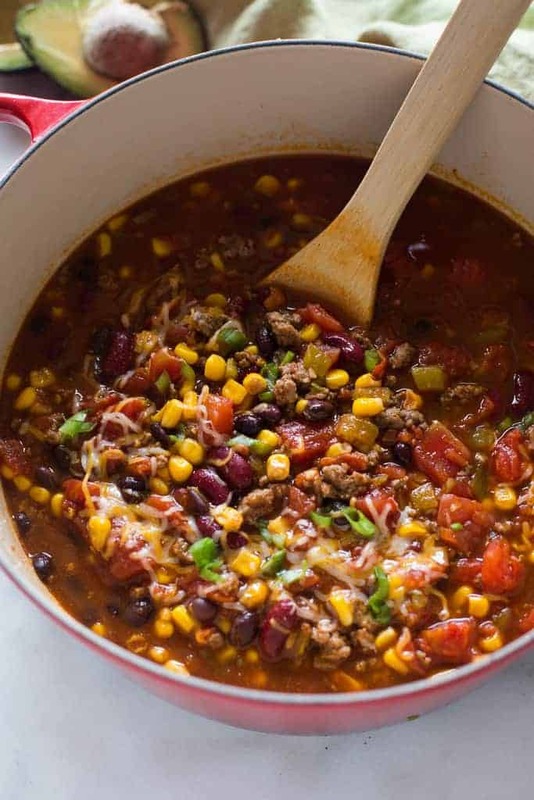 To freeze this taco soup, make the soup and allow it to cool to room temperature. Then store it in a gallon freezer zip lock bag or in a tupperware. Freeze for up to 3 months. To reheat, thaw the soup in the refrigerator overnight and simmer it for about 25 minutes on the stove top. 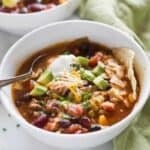 This easy taco soup recipe is one of my favorite dinner solutions when I want something quick and tasty that my family will LOVE! It can be made in the slow cooker or on the stovetop. Heat a Dutch oven or soup pot over medium heat. Brown the meat and drain any grease, if needed. Add remaining ingredients and stir to combine. Bring to a boil, then reduce heat and simmer for 20 minutes before serving. Garnish with desired toppings. For the Slow Cooker Instructions: After browning the meat, place all the ingredients into a slow cooker and cook on low for about 6-8 hours. To Freeze: Leftovers freeze great! You could even freeze individual portions in a 12-oz freezer safe container; makes for a great quick lunch or dinner. Hi, if i want to make this recipe for 40 people, how would i measure please? My favorite taco soup! MY husband loved it too, we were fighting over who got the left overs the next day ? IT is super quick and easy with the perfect blend of spices. I didn’t have time to let it simmer for 20 mi it’s so I just kept it at a boil for five minutes and it turned out perfect. love it! Can I share on Facebook ? Yes, of course. I have share buttons at the bottom of my posts. Thanks for sharing. Does this work well with ground turkey? Did anyone else get halfway through this recipe before they had the realization ‘Hey this is just chili with broth’? ? Anyway, ‘chili soup’ is lovely too. ? I added one more cup of broth to make it go a lil further, as well as some flour & butter to thicken the liquid & make it slightly creamier, to make it just a tad different so that my family didn’t just think it was ‘chili ‘AGAIN’ this winter lol. Ate with homemade artisan bread. ..Thanks.. I made this for dinner a few nights ago and it was awesome! I also have leftovers for a friend who was sick and she raves about it. Thanks for a great recipe! I make this soup ALL THE TIME! I use a mandolin to super thinly slice jalapeños and onions and cook them with the meat as well. We make this probably once every couple weeks, I even have the recipe printed in case something ever happened to this blog. We add spicy picante sauce and sour cream at the end.